How you carry your sidearm matters. Choose one of the best holsters for Glock 17 pistols to ensure your comfort and reduce your reaction time. The Glock 17 is a larger pistol than the Glock 19 which makes it a little less comfortable for concealed carry. That being said, we chose both IWB and OWB holsters for our reviews today. You may find that a pancake-style holster takes care of the problem. It keeps your weapon close without printing through your clothes. But we included holsters suitable for duty wear, too. We’re happy you’re here to see our picks for the top Glock 17 holsters. Let’s get started with one of the most popular choices for law enforcement. LEOs on the front lines love the BLACKHAWK! Serpa duty holster. Why? Because it prevents perps from grabbing your weapon. It has both the Serpa firearm retention system as well as a secondary lock on top. Your weapon isn’t going anywhere until you say so. Yes, this level of security slows down draw time. But it saves lives – yours and those around you. The Serpa lock clicks into action the moment you reholster your gun. And the secondary lock is not a hood or snap that can break off, wear out, or get in your way. Instead, the holster has a thumb-activated Pivot Guard. Since you already have enough weight to carry around, you’ll be glad to know that the injection-molded carbon fiber composite weighs just over half a pound. The adjustable cant lets you choose the angle for an easier draw. You can adjust the passive retention pressure, too. The BLACKHAWK! Serpa CQC concealment holster has level II protection against holster grabs. This isn’t quite as elaborate as the Serpa duty holster above, but it will give you peace of mind. It also allows for a quicker draw and re-holster. As soon as you place your weapon inside, it audibly clicks. You can also adjust both the passive retention and the cant with the appropriate screws. 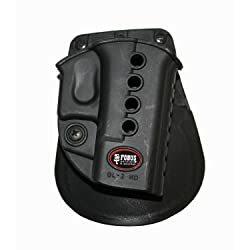 This holster comes with a paddle platform and belt loop. Use the guides to adjust the slots for your belt. Moreover, it’s available for either right or left-hand draw. BLACKHAWK’s Sportster holster comes with a paddle mount only. It’s a smart choice for the range and nice for new shooters. That’s because you can experiment with the cant. The finger release button keeps your gun safely holstered until you’re ready to use it. Plus, the moment you holster your weapon, you’ll hear an audible click to confirm that it’s secure. The polymer material is very durable and molded to fit Glock 17, 22, or 31. It’s available in either left or right-hand orientations. Safariland’s 6365 holster protects you with their automatic locking system plus a rotating hood. Once you holster the gun, it’s locked into place. Then all you need to do is move the hood with your thumb and draw your Glock straight up. The holster fits up to 2-1/4-inch belts and it rides low. This holster from Concealment Express suits a variety of carrying styles. Choose from cross draw, appendix, hip, or palm-in back. Then set the cant, or carry angle, between 0 to 15° with a regular Phillips screwdriver. The Kydex material is a favorite choice among holster manufacturers because it molds perfectly to the shape of the weapon. It’s also very rugged and lightweight, weighing only 2 ½ ounces. This holster makes an audible click when you engage the retention lock. It also has a full-length sweat guard as well as corrosion-resistant hardware. It’s backed by an unconditional lifetime warranty and satisfaction guarantee. The Israeli-designed Orpaz holster fits both Glock 17 and Glock 19. It was created by a SWAT veteran who took into account several key features. First, it has level II retention with a thumb break retention clip. Second, the passive retention and rotation are fully adjustable with an Allen wrench. Third, use the ambidextrous holster for small of back (SOB), cross draw, or strong side carry. It fits on either a 1 ½ or 2-inch wide belt, but you can wear the paddle without a belt. The OWB paddle is curved to conform to your body. Finally, the holster has a channel to protect your gun’s sights. The Defender holster from Relentless Tactical fits a wide variety of 9mm, .40 and .45 caliber guns. These include Glock, Sig Sauer, and Springfield pistols. It’s made from bull hide leather and available in three colors like Midnight Black, Whiskey Barrel Brown, and Charred Oak. Although it may take a little while to break in, it’s covered by a lifetime warranty. Relentless Tactical also makes a suede holster that feels softer than their bull hide leather model. This one has a metal clip that allows you to wear it without a belt. And it fits a variety of pistols including the Glock 17. Of course, it comes with a lifetime warranty. The polymer CYTAC paddle holster stands up to harsh conditions and nasty weather. It has a fluid-feeling quick release button that keeps your weapon secure. It also lets you adjust the passive retention and the cant with the included Allen key. You’re likely to see this holster worn by Israeli special forces. But you may also see it used by the military anywhere in the world. The Fobus Glock holster weighs only 2 ounces. The rubberized paddle features steel reinforced rivets for extreme durability. It has a channel that protects your sights, too. You’ll never need to oil this high-riding, low-profile holster. Plus, it’s covered by a lifetime warranty and 100% customer satisfaction guarantee. Safariland has a proprietary automatic locking system that protects against holster grabs. It features a thumb-activated button that won’t slow down your draw. It also has raised standoffs inside that reduce friction. The DuPont SafariSeven nylon material won’t scratch your pistol. But it can tolerate down to -50 F and up to 300 F without warping. The paddle comes with an adjustable belt slide and belt loop that lets you adjust the carry angle. Try the Alien Gear’s Cloak Mod holster for 30 days to see what you think. If you love it, keep it, and enjoy the lifetime warranty. It features adjustable cant and retention because of its spring steel flexplate. Furthermore, you can wear it as either a paddle or belt slide. Alien Gear offers to swap the custom-molded retention shell if you trade in your gun in the future. The shell is an elastomer that won’t abrade the finish of the weapon. Besides this olive drab model, Outlaw Holsters makes a variety of Kydex holsters with custom designs printed on them. Each paddle holster has two belt loops that you can replace with speed clips. And each one is custom-molded to the gun. They come with a one-year replacement warranty. Law enforcement officers have trusted Bianchi with their weapons for decades. The Vanguard holster is built with Accu-Mold Trilaminate with a Coptex inner lining. The lining protects the gun from abrasion and reduces friction for a smoother draw. The curved holster fits duty belts up to 2 ¼ inches wide. It has the traditional top-draw thumb snap and standard ride. If you have red dot sights (RMR) on your Glock, get the Bravo Concealment OWB holster. It can handle tall sights, or you can use it when the sights aren’t mounted, too. The Kydex construction is lightweight but rugged. Even though it has an over the waistband design, it’s thin and it hugs your body. The cant is fixed at 10 degrees forward. There are no thumb releases to slow down your draw. Furthermore, it comes with a 30-day money-back guarantee if you aren’t happy with it. The holster sports protection against gun grabs with the Serpa auto lock thumb release and pivot guard. Meanwhile, the adjustable rubberized leg straps and Y-harness keep the holster in place even when you kneel. It won’t block your pants pocket, either. Should you need to remove the holster in a hurry, just press the swivel buckles to release it. There are many holsters perfect for the Glock 17 whether you carry for work, play, or personal protection. It’s easy to get started shopping once you decide on a few points. Will you want concealed carry? Extra protection against holster grabs? What about adjustable cant? And don’t forget to select a holster based on your left or right-hand draw. We hope that our reviews today helped you select the right holster for your Glock 17. Check the top holsters for the Glock 19, too.